Palm Sunday always has such a celebratory mood. It was fun to see the choir waving Palm branches as they sang this morning. On my way out the door I noticed a discarded palm fron on the patio. 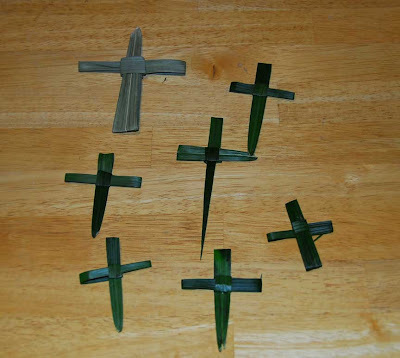 So I picked it up and 'borrowed' a few leaves to make some traditional palm crosses. One to add to my collection and the rest to put in Easter cards. Click here for instructions for making a Palm Cross.